The varied array of needles shown in the photo include some that are more than 80 years old. The old English needle guages are still useful and the blue needle box has guage holes along the top. 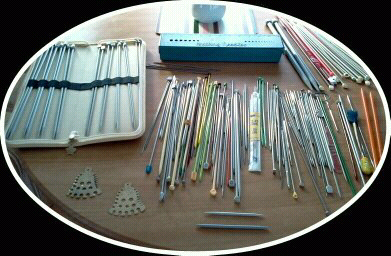 Do you call them knitting pins or needles? For the purpose of this blog I will refer to them as needles. Most patterns give the required size needles in mm (millimetres) as well as the UK traditional size. Don't forget to check you're knitting tension before you begin. Choose your needles carefully. It makes a difference to your enjoyment if they are right for the job, so after you've found the correct size and length for your task consider whether you prefer plastic or steel. Some very cheap needles are great but some are too bendy or too slippery and plastic needles can break in the middle of a row if they're really poor quality. Round needles are useful for socks and gloves. Knitting is so wonderfully portable! Just shove it in a shoulder bag and off you go! Truly dedicated knitters know it can be addictive and feel lost going off without their needles! If you've decided to make knitting a paying hobby or a business take it with you wherever you go. It's also quite ok to knit while waiting at hospital and other serious times. Knitting, like many crafts, is theraputic. In moments of anxiety it calms the nerves and helps those fretful hours pass.